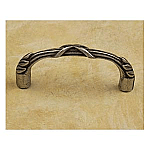 #15-A Matching Cabinet Hardware in 38 custom finishes - Pulls, Knobs, towel Bars, and more. #15_B More Cabinet Hardware in 38 custom finishes. Animals, Flowers, Asian, French Country, etc. #23. Specialty Items, Vent covers, Blue Marbleware, Despard Plates, and more! After hours, leave a message, or call our warehouse 847-220-0396 till 7 PM Eastern time, as we may be available. Please fill in the dropdown to continue! 100% lead free pewter with brass finding. 3.5"W .25"H 1.25"Projection 3"ctc. Coordinating knobs and pulls #AP1308 #AP1300 #AP1302 #AP1303 #AP1305.